Please sign in to purchase The Year of Puzzles. If you have already purchased the Year of Puzzles, please sign in to access the content. Welcome to the Year of Puzzles, the year-long puzzlehunt of eighteen unique, wonderful, interconnected puzzles from Puzzazz. Each puzzle in the Year of Puzzles is a great experience by itself, designed to challenge you just right to maximize your fun. 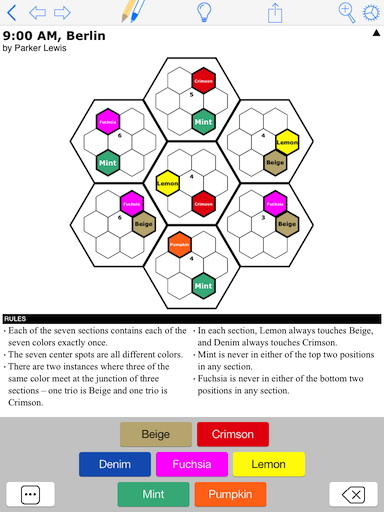 Some puzzles look like traditional puzzles, and many don't look like any puzzle you've ever seen before. Puzzlehunt authors love to create unique twists. In the Year of Puzzles, you'll find spirals and magic carpets, a crossword with irregular cells, a mixed-up cryptogram, a rows garden, a twisted word search, and even some that don't look like a puzzle at all, like a periodic table. Puzzlehunts end with a larger puzzle called a metapuzzle which wraps everything up with a satisfying conclusion. The Year of Puzzles ends with a bang with not one but four metapuzzles. Every title at Puzzazz starts with a free puzzle, and the Year of Puzzles is no exception. 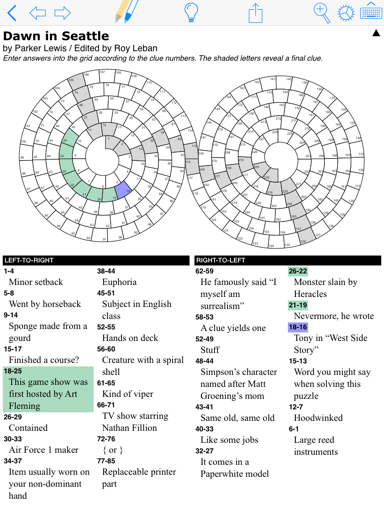 The free first puzzle is a great one: a unique double spiral crossword. To solve, simply open the Year of Puzzles in the Puzzazz app on your iPad or iPhone and turn to the first puzzle. If you prefer to solve on paper, we've got you covered too. Download the PDF here, print and solve. And, if this isn't quite enough to whet your appetite, the Kickstarter campaign that launched the Year of Puzzles contained a complete free mini puzzlehunt -- 17 fun mini-puzzles, plus a metapuzzle at the end, a first on Kickstarter.